Almighty ever-living God, who, by a singular grace, gave the Priest Saint Pius a share in the Cross of your Son and, by means of his ministry, renewed the wonders of your mercy, grant that through his intercession we may be united constantly to the sufferings of Christ, and so brought happily to the glory of the resurrection. Through our Lord Jesus Christ, your Son, who lives and reigns with you in the unity of the Holy Spirit, one God, for ever and ever. Padre Pio was born in 1887 in the small Italian village of Pietrelcina. He joined the Capuchin Friars at the age of sixteen and was ordained a priest seven years later. For fifty years at the monastery of San Giovanni Rotundo he was a much sought after spiritual advisor, confessor, and intercessor whose life was devoted to the Eucharist and prayer. Yet despite such notoriety, he would often say, "I only want to be a poor friar who prays." According to the 1962 Missal of St. John XXIII the Extraordinary Form of the Roman Rite, today is the feast of St. Linus, the immediate successor of St. Peter in the government of the Church. He is mentioned after the apostles in the Roman Canon of the Mass (Eucharistic Prayer I). It is also the feast of St. Thecla, a virgin of Asia Minor in the early days of the Church. Her cultus, which is very ancient, goes back to the second century. She is considered the first woman martyr. Born to a southern Italian farm family, the son of Grazio, a shepherd. At age 15 he entered the novitiate of the Capuchin Friars in Morcone, and joined the order at age 19. He suffered several health problems, and at one point his family thought he had tuberculosis. He was ordained at age 22 on 10 August 1910. While praying before a cross on September 20, 1918, Padre Pio received the stigmata. He is the first priest ever to be so blessed. As word spread, especially after American soldiers brought home stories of Padre Pio following WWII, the priest himself became a point of pilgrimage for both the pious and the curious. He would hear confessions by the hour, reportedly able to read the consciences of those who held back. He was reportedly able to bi-locate, levitate, and heal by touch. In 1956 he founded the House for the Relief of Suffering, a hospital that serves 60,000 a year. 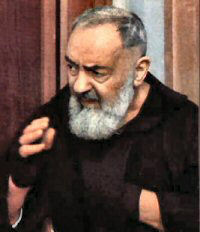 Padre Pio died on September 23, 1968 at age 81. Today there are over 400,000 members worldwide in prayer groups begun by Padre Pio in the 1920s. His canonization miracle involved the cure of Matteo Pio Colella, age 7, the son of a doctor who works in the House for Relief of Suffering, the hospital in San Giovanni Rotondo. On the night of June 20, 2000, Matteo was admitted to the intensive care unit of the hospital with meningitis. By morning doctors had lost hope for him as nine of the boy's internal organs had ceased to give signs of life. That night, during a prayer vigil attended by Matteo's mother and some Capuchin friars of Padre Pio's monastery, the child's condition improved suddenly. When he awoke from the coma, Matteo said that he had seen an elderly man with a white beard and a long, brown habit, who said to him: "Don't worry, you will soon be cured." The miracle was approved by the Congregation and Pope John Paul II on 20 December 2001. Adapted from the Discount Catholic Store, Inc.
St. Pio is a saint of the last century, so there are many pictures and biographies to read more about his life. Having this gift of the stigmata was very hard on his life — both physically and emotionally. Find out more about the stigmata and his other mystical gifts, such as bilocation. St. Pio also had great devotion to his guardian angel. From the Catholic Culture library: Biography of Padre Pio of Pietrelcina, The Devil and Padre Pio, Five Maxims for Living a Devout Life and His Wounds Spoke of God's Love for All. There are many other documents in the library which may be found by searching for "pio". Following the crucifixion of Peter, Linus, who had served as an assistant to the apostle, continued the leadership of the Church, for once the Christian faith had been firmly established in Rome, Peter and Paul had commended Linus to this responsibility. However, because the one-man episcopate had not yet emerged in Rome, we have no way of knowing exactly what duties were expected of Linus. In a letter directed to the Oriental churches, Linus told how Peter's body was taken from the cross by Marcellus, bathed in milk and wine, and embalmed with precious spices. Linus, believed to be the son of Herculanus, was an Italian from the region of Tuscany. He has been identified by the early writer, Eusebius, as the same Linus who is mentioned by St. Paul in his letter of salutation from Rome to Timothy in Ephesus. His episcopate is said to have been approximately twelve years. A brief respite from persecution for the brethren is said to have existed at this time, for legend has it that Nero, in a frightening vision, was so chastised by Peter that he abandoned the wrath which he had once so fiercely set upon the Christians. Much is unknown of Linus, to be sure, but it is said that he, at Peter's direction, decreed that all women would now cover their heads when entering a church. In the ancient canon of the Mass, his name is cited after those of Peter and Paul. According to legend, Linus was martyred and buried on the Vatican Hill alongside his beloved Peter. Symbols: Triple cross; fleeing demons. This child of St. Paul is honored by the Fathers of the Eastern Church as proto-martyr and "near apostle." Already during the second century legends concerning her were current and her grave was much visited by pilgrims. It is historically certain that she lived, but the Acts of her life are largely legendary. According to these she was born at Iconium, where she was converted to Christianity by the preaching of St. Paul. It is related that she was "accused of being a Christian by her own parents after she had refused to marry Thamiris, in order to give herself wholly to Christ. But the pyre enkindled for her burning was extinguished by a sudden downpour of rain as she threw herself into it, making the sign of the Cross. Then she fled to Antioch, where the ferocious beasts and bulls to which she was tied would do her no harm. Nor did she suffer injury during confinement in a snake pit. Because of these marvels many pagans accepted the faith. Thereafter Thecla returned to her native land, where she lived in solitude upon a hill. At the age of ninety she died a peaceful death." Symbols: Lion; tiger; two or more serpents; globe of fire; flaming fagots; Greek cross. Since most ancient times St. Thecla has been highly venerated, especially as patron of the dying. Her intercession is still invoked in the litany during the rites for the dying and in the Church's official prayer for a departing soul: "As Thou didst deliver the holy virgin and martyr Thecla from three most gruesome torments, so deliver the soul of this Thy servant; and let him (her) enjoy with Thee the blessings of heaven. Amen." Read the activity Prepare for Death and maybe say the prayers of Recommendation of Departing Soul.